The idea for this pizza came from one of my younger readers, Michael. The budding chef suggested I create an omelet pizza recipe. I loved the idea so we had pizza for breakfast this weekend. In preparation for the pizza I scrambled eggs and cooked sausage and bacon. I spread a mixture of marinara sauce and salsa on the dough, topped it with mozzarella cheese and arranged the eggs, sausage and bacon. This pizza was delicious and such a nice change from my standard cereal at breakfast time. 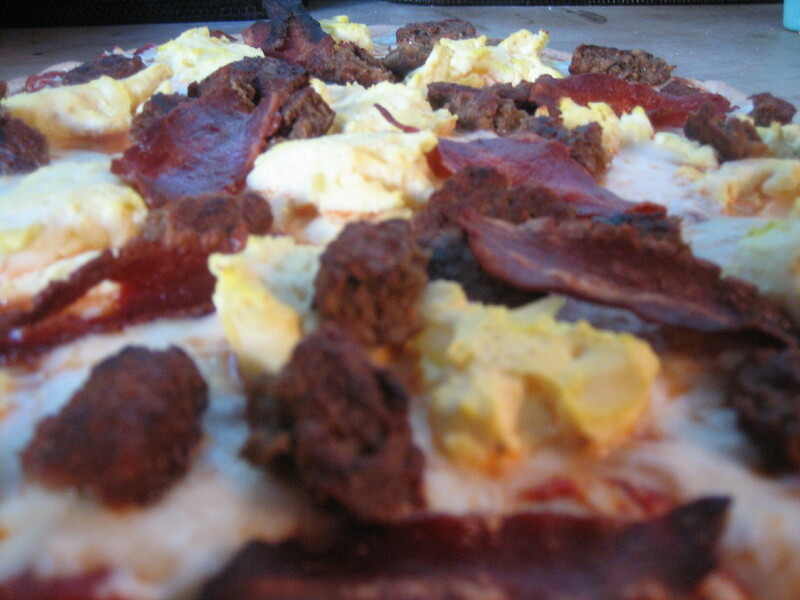 I love the idea of having pizza for breakfast, but I wonder what else could I put on a breakfast pizza? Thanks Michael! This entry was posted in Bacon, cheese, marinara, mozzarella, salsa. Bookmark the permalink.